A team of engineers from the University of California San Diego and audiologists from San Diego State University has set out an ambitious timetable for delivering two new electronic platforms to dramatically improve and accelerate research on better hearing aids. Led by Qualcomm Institute research scientist Harinath Garudadri as well as UC San Diego co-principal investigators and Electrical and Computer Engineering (ECE) professors Patrick Mercier and Bhaskar Rao, the UC San Diego-SDSU team has been awarded a $2.1 million grant from the National Institute on Deafness and Communication Disorders (NIDCD), one of the National Institutes of Health (NIH). In his presentation tentatively scheduled for Thursday, August 11, Garudadri will spell out plans for finalizing a desktop lab, before shrinking it to fit on a tiny wearable device with an embedded processor such as Qualcomm’s Snapdragon chip sets. “Snapdragon processors have been optimized for low power, a powerful digital signal processor [DSP], a general-purpose CPU, and multiple wireless connectivity options,” notes Garudadri. According to the research scientist, the initial desktop system is based on a signal processing chain supporting hearing-aid functions including sub-band amplification, dynamic range compression, feedback cancellation and remote control for investigating self-fitting methodologies. 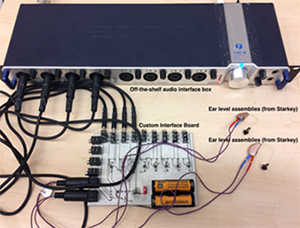 There is also a custom interface board and an off-the-shelf audio interface box (pictured) for interfacing to ear-level assemblies. The remote is then implemented on an Android device and the protocol stack is extensible beyond controlling the gain and compression parameters. In collaboration with SDSU audiologists Carol Mackersie and Arthur Boothroyd, the team will study self-fitting methodologies. The engineering team is soliciting collaborations with audiology and hearing science labs interested in improvements in intelligibility in multiple-noise environments, development of objective metrics to characterize hearing loss and to quantify improvements in intelligibility, binaural processing to improve intelligibility, and more. 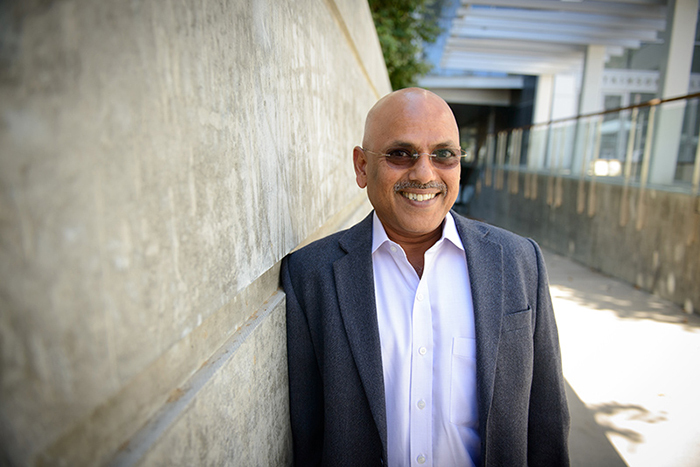 In addition to Garudadri and co-PIs Mercier and Rao, the UC San Diego team includes collaborator Rajesh Gupta, a professor in the Computer Science and Engineering department and associate director of the Qualcomm Institute, whose research is focused on energy efficiency and mobile computing issues in embedded systems. Student researchers on the project include two ECE grad students — Ph.D. student Ching-Hua Lee and M.S. student Swaroop Gadiyaram — as well as CSE Ph.D. student Sean Hamilton, who is also a software engineer at Tortuga Logic, a chip design security startup founded by CSE Prof. Ryan Kastner and CSE alumnus Jason Oberg (M.S., Ph.D. ’12, ’14). Rounding out the Open Speech Platform staff are Qualcomm Institute software developer Justyn Bell, and audio engineer Raphael Melgar, who works in QI’s Sonic Arts R&D group. In keeping with the funding agency’s guidelines, the team has committed to supporting deployment of the new platforms at a minimum of three outside labs involved in hearing healthcare. One has already been selected, and Garudadri expects to begin speaking with other potential user communities at IHCON. Expressions of interest will also be submitted online through the project website. While the commitment is to support three labs with hardware, software and technical support, Garudadri notes that the team anticipates that the technology will be made available to many more institutions and independent researchers than just the three mandated labs.